The world of AV technology today means the church AV staff/department must always be variable. Variable based on changes in technology and variable based on the Lord¹s leading as church pastors and worship leaders apply these new technologies. Technology is changing all around us and churches cannot be locked in one direction. Whether it be projection, lighting, sound or cameras, elders and facility managers tend to have the idea that a system upgrade equates to a budget line item completed for the next ten years; however, in today¹s technology savvy world that idea is changing! As a seasoned AV specialist, “what was” standard has rapidly become obsolete and to stay relevant AV specialists must continually evaluate their systems. In a very short time period, distributing sermons has moved from cassette tapes to CDs to USB drives and now streaming. Why the need for change? Because the church’s needs changed! Delivery must be quick, and easy to hear or view on demand. In the congregation I serve, many listen to the sermon on the way home from church on their smart phones to reinforce their understanding of the message presented moments ago. Projection delivery systems have evolved from overhead projectors with words on sheets of acetate to projectors with computers running every system imaginable. Even the delivery from the computers is changing. VGA has long been the standard but many are moving to HDMI, Media Ports and DVI systems. While these rapid technological changes are obvious, the flexibility of the newer systems allows rapid changes within one Sunday church service. The congregation will never know of the numerous changes in a service, but a progressive AV specialist should expect to make changes at a moment’s notice. Pastors and teachers have been given the directive to listen to the leading of the Holy Spirit. However, when our church worship leaders arrive on Sunday morning with changes to slides or the direction or flow of the service, the AV specialist bristles. Sometimes I receive a notice by text or email from our worship team or teaching pastor at 11pm on Saturday night to add scripture slides or pictures. Should I complain? Should I state the obvious, that it is not what was discussed or rehearsed? Now is the time to remember our purpose for being there and God’s leading. The vision statement at my church, Browncroft Community Church, is simple: Inviting people into a life-changing relationship with Jesus; and most churches will have a similar statement. This is our purpose as well, as AV specialists to accommodate the worship leaders needs to that end, making the service a worshipful experience for all who come. God has placed the pastor and leaders in their positions to listen closely to God’s leading. The AV team must be willing to do whatever it takes to deliver this message to the congregation as cleanly and directly as possible. We should be ready for changes, even to the point of having someone ready to change the format of pictures to fit the screen. Maintain blank templates designed for the scriptures to readily insert new scripture verses with ease. Define the parameters of font style for scriptures and songs, and keep this standard in your templates. Develop an accessible song library ready for insertion at a moment’s notice. Backup microphones are critical, especially if you use wireless. Batteries must be available at all times. Review time with the pastor is essential to presenting a cohesive message and if you have the luxury, rehearse the flow of the slides and the pastor’s delivery. These are some starting points (but for many readers, I’m preaching to the choir). From there, the AV team must remember to keep a flexible heart. The AV Specialist must be ready for the Spirit’s leading and accommodate change. Allow the Spirit to interject a song through the Worship Leader. God has this leader there for a reason – to LEAD IN WORSHIP. It is our job to let them lead and let God use them. The verses from Proverbs 3:5-7a, have been important verses to me in life, but never more so than working in AV. God knows what He is doing. We need to listen to God’s voice and the people God has put into place as leaders. It is our job to make it look as seamless and worshipful as possible; as though we knew it would be that way all along. Roger has been 30 years in production for live road kshows for Up With People to Eastman Kodak in their heyday, and did many years of installation and audio management around New York State for educational and professional installations, from Colleges to private business and government facilities. 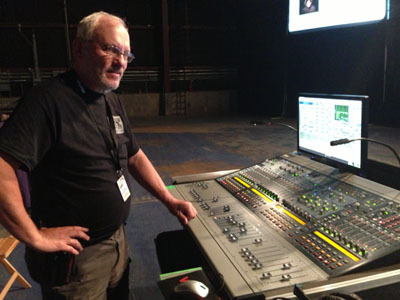 He is now at Browncroft Community Church in Rochester, NY and is full time as the AV Specialist there.